I previously wrote a post on MVC async controllers. Now I want to follow up on something that’s more cutting edge, unfortunately I’m one of those people that like nosing about with what new, how it will affect me and how I could leverage it in future etc., Often, I’ll readily admit it’s more bleeding edge than cutting edge (xaml support in Blend5 for example ). However in this post I want to show you something that you might agree is pretty nice. So lets take a look at the app we’re trying to build. So as you can see, we’re waiting at least 20 seconds for our page to return, nasty. In theory we should be able to bring this down to 10 seconds as we can make the calls to the workflows in parallel. So we’re using the task library to make the two workflow requests async, and results look promising, down to about 10 seconds now… so any problems with doing this? Well, tasks use threadpool threads to execute. So, the query will execute on a threadpool thread. To get true asynchronous execution(no worker threads blocked), we need to jump through a few more hoops. For webform people, there’s a very good explanation here. MVC people read on! The response to this question has been discussed many times in both books and magazines. 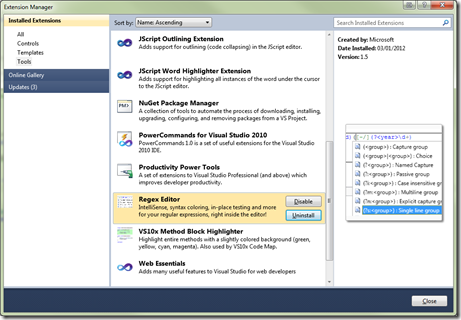 ASP.NET uses threads from a common language runtime (CLR) thread pool to process requests. 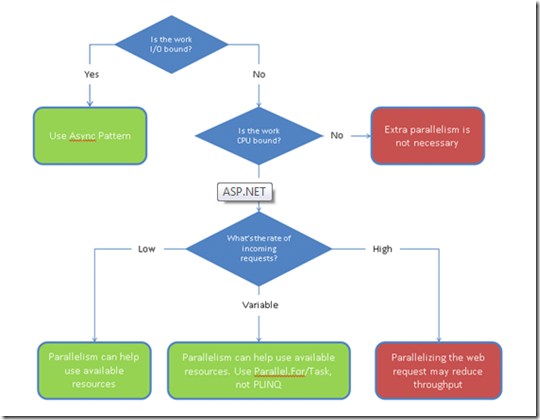 As long as there are threads available in the thread pool, ASP.NET has no trouble dispatching incoming requests. But once the thread pool becomes saturated-that is, all the threads inside it are busy processing requests and no free threads remain-new requests have to wait for threads to become free. 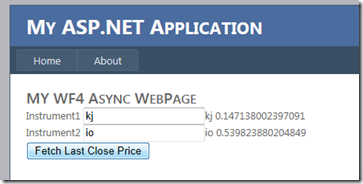 If the jam becomes severe enough and the queue fills to capacity, ASP.NET throws up its hands and responds with a "Server Unavailable" to new requests. Often to solve the problem of horizontal scalability more servers are added to the webfarm, however this only provided temporary relief to what in fact is an underlying design problem, it’s not a case of adding more processors(threads) but a case of using the threads more efficiently, as you can see from the diagram below, if you are CPU bound, there is little more you can do but add some more servers. So what is this telling us? Basically, if your app is I/O bound then you should use parallelism, if requests are computationally cheap to process, then parallelism is probably an unnecessary overhead. If the incoming request rate is low, then the Web application could benefit from parallelism by using the idle CPU cycles to speed up the processing of an individual request. We can use either PLINQ or TPL (either Parallel loops or the Task class) to parallelize the computation over all the processors. Note that by default, however, the PLINQ implementation in .NET 4 will tie-up one ThreadPool worker per processor for the entire execution of the query. As such, it should only be used in Web applications that see few but expensive requests. In the previous action method, the calls to newsService.GetHeadlinesAsync andsportsService.GetScoresAsync are called asynchronously and do not block a thread from the thread pool. 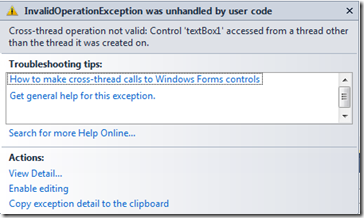 Asynchronous action methods that return Task instances can also support timeouts. To make your action method cancellable, add a parameter of type CancellationToken to the action method signature. 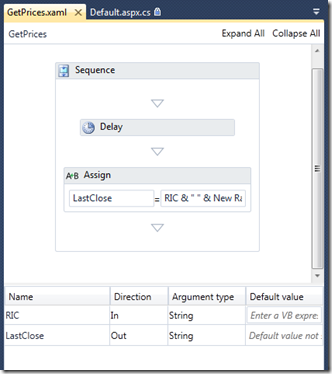 The following example shows an asynchronous action method that has a timeout of 2500 milliseconds and that displays a TimedOut view to the client if a timeout occurs. MVC4 Makes programming of async controllers even easier. So my wife left me for a hen weekend and I needed something to do with my time. Friday night I dedicated to my real work to clear my conscience and then I went to play. 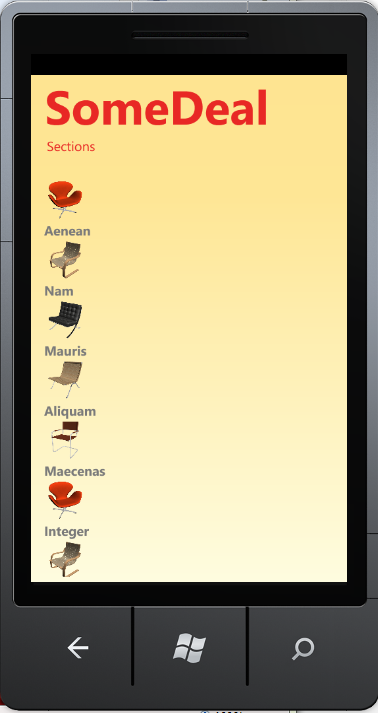 So for a bit of fresh air I started writing the WP7 app, at least this is more familiar ground to me having written quite a few of them already, and I just took my resource dictionaries from the WinRT app. 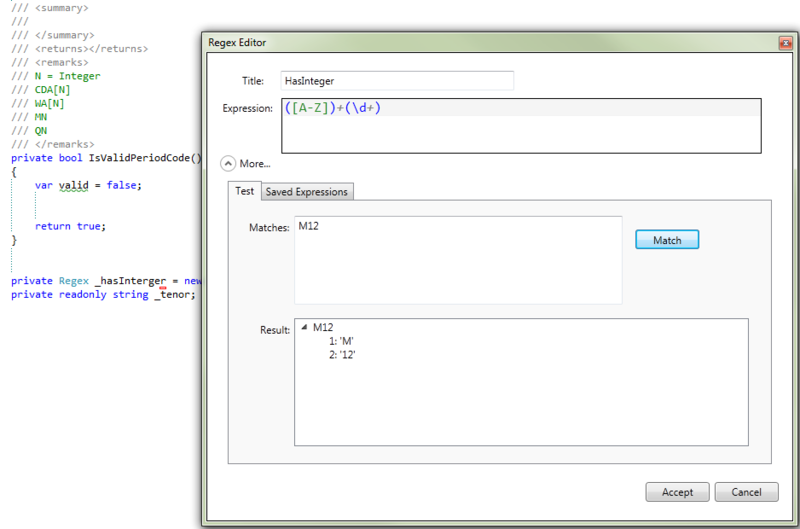 To start with I just used some sample data in expression blend, dropped on a list box and bound my sample data to it. But the layout wasn’t really what I wanted. I’m hoping that that API for the real data may provide me with a list of categories, one wouldn’t really want to have to release a new app every time a new section was added would they. So my approach would be just to bind the data to a list for now (it may well turn out to be an ordered list in the API). The problem as you can see above what that I was getting a single row for each item.. not what I wanted. 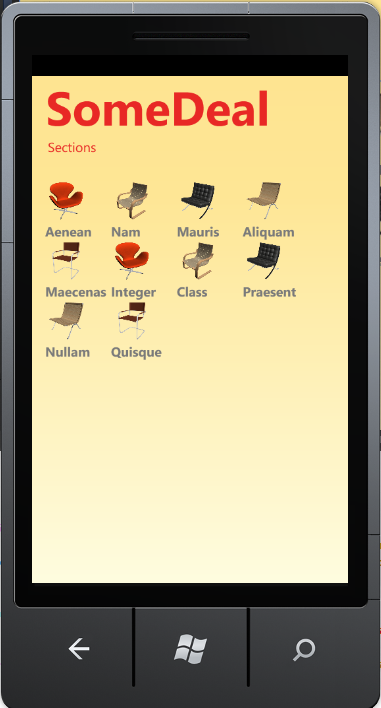 Would you believe this was the first time I’ve not wanted this default layout in a WP7 app, so I decided to use the WrapPanel container that I’ve previously used in a WPF app… but alas it doesn’t exist out of the box! 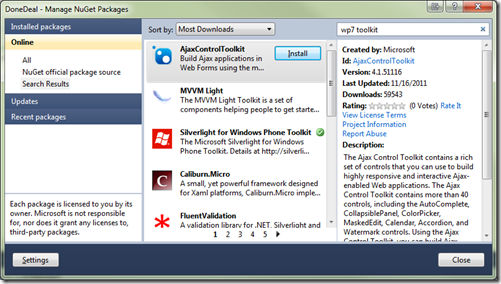 Silverlight WP7 Toolkit to the rescue. 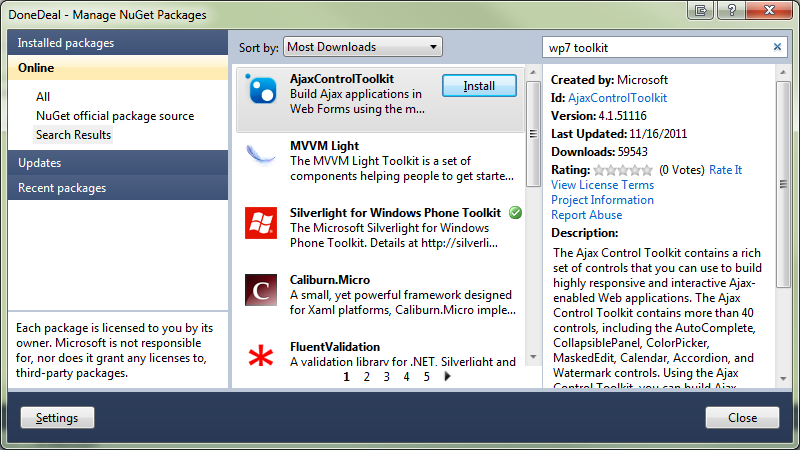 A quick Google indicated that the WP7 toolkit had the WrapPanel I was looking for, I fired up the Nuget package manager and added it to my project. One more change was needed in my xaml, I needed to specify where to use this wrap panel. This I specified in the ItemsPanelTemplate of the listbox in question. Hi again, this is my last post were I compare the same WinRT application written in three different ways. I have to admit, this really took me by surprise! It was pretty painless. I had it written off before I even tried it, but this task proved somewhat simplistic. I’d one little obstacle trying to use a CDN, but other than that it was trivial. So the penny has dropped, the WinRT developer pool is going to be massive! I predict good things. If Microsoft play their cards correctly it will be a very successful platform (even more so with the promises of WP8 portability). So I compared the three different approaches, for the task in question c#/xaml or js/html won hands down. I think each option would have to be considered on an application per application basis. As part of this WinRT comparison I’m doing, I next need to recreate my apps in html+js. 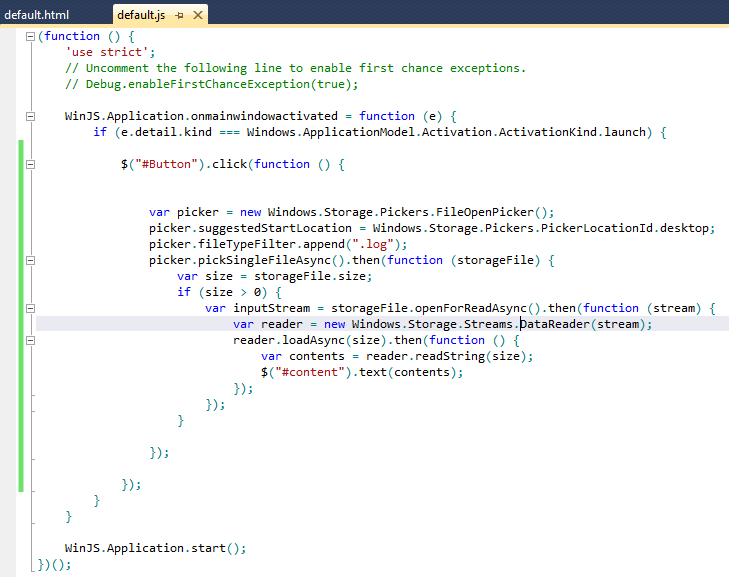 This is my first WinRT app I’ve written in html+js and right off the mark I hit a problem with the WinRT sandbox. These days I won’t write a web app without jQuery it’s just awesome. so I wanted it in my app. My first instinct was to use Nuget to bring down jQuery for me, but alas no Nuget extension that I could find for vs11, so next easiest step was to use the CDN. doesn’t work. 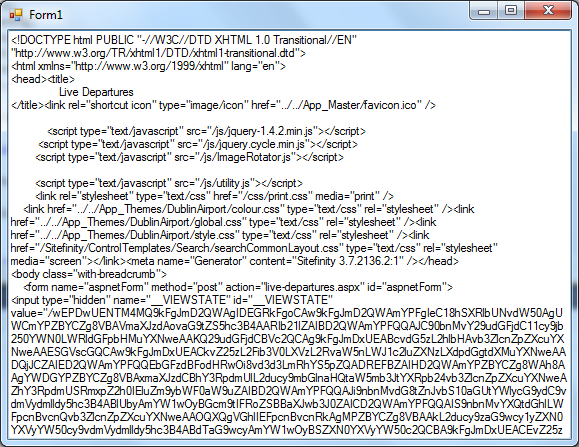 So I go to jQuery.com, download it, and then use add the local script, now it all works. hopefully this post might save someone a few minutes of head scratching. I left my last blog very indecisive, would I use CPP, would I use .NET or would it be html/js. Again I’m thinking Cpp is really for faster and better performance, and while it might even be the hands down winner on ARM architecture, I don’t expect to see any performance differences in the app I’m going to write. I’m actually going to write the same application 3 times, and I’ll review my findings as I go along. 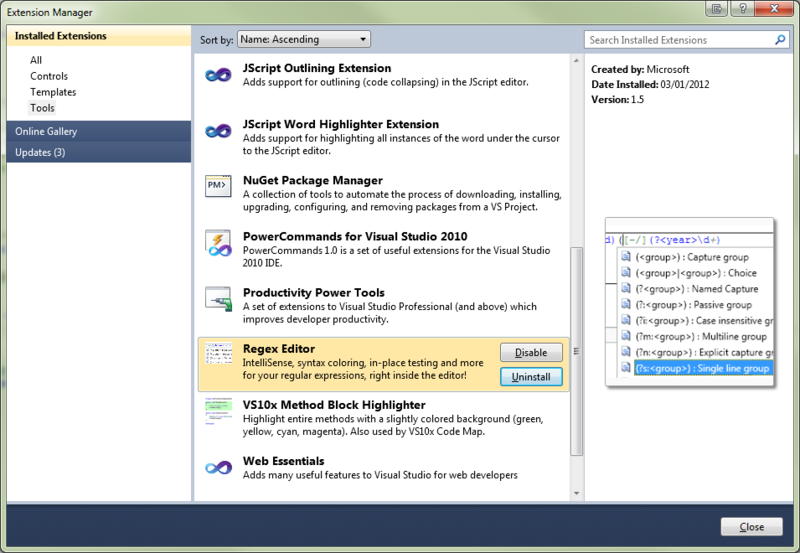 I’ll present the c++ and the c# apps here and the html/js will follow in the next blog post. First up was the cpp. To be honest I did find this painful to write, the syntax is pretty convoluted. At least the markup for cpp is Silverlight so that was a no brainer. 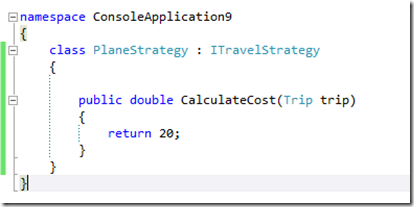 I’ll even use the same markup for the C# application. Now I’m not going to explain every trivial detail, but’s here where I felt I c# won out. I’m fast at typing, but using . is a lot faster than –> for pointers. The async await construct is just magical!, now, to those you who I’m sure will complain that I’m comparing apples with oranges, you have a bit of a moot point, in C++ I could have used the parallel patterns library to make it a little neater, but nowhere near as close to C#. My next post I’ll rewrite the same application in html + js. I predict that the syntax is not that difficult but productivity is where I feel I may fall down… let’s see.. It promises to be interesting. It’s COM Jim, but not as we know it! If you stayed in unmanaged land then you’ve probably still very familiar with, ATL, HResults etc. However if on the other hand, like me, you progressed into the managed realm, then those icons above probably sum up your recollections. For me I once considered myself pretty hot in C++ (shamefully I still do but I’m sure I’d have to spend a week hands on to really tick that box), COM collections on stl (ICollectionOnSTLImpl) were a walk in the park, multiple inheritance was a given and finding you didn’t release a COM reference was the highlight of your day. But, fast forward a few years and then you really scratch your head as to why life had to be so difficult. COM means HRESULTS – No, C++/CX gives yields exceptions from the underlying Fail HResults. COM means interfaces - C++/CX takes care of IUnknow/IDispatch, if fact IDispatch has been superseded. COM means no inheritance - C++/CX takes care of this for you. So will I develop my apps in C++/C#/JS+Html (come on don’t expect me to add VB.NET that battle was lost a long time ago . C++ maybe, depends on how much pref i need from my machines (sacrificing time to market), if i want to use an existing library, Parallel patterns library, C++ AMP etc. JS+HTML, I’m not sold on this yet, maybe, if i want to produce for the web then I choose js+html+asp not silverlight, would I ever have enough of a code base to reuse on WinRT? ?… jury is out.. Pretty cool if I say so myself. Disclaimer: I’ve been using visual studio since the mid 90ies so I’m truly biased. 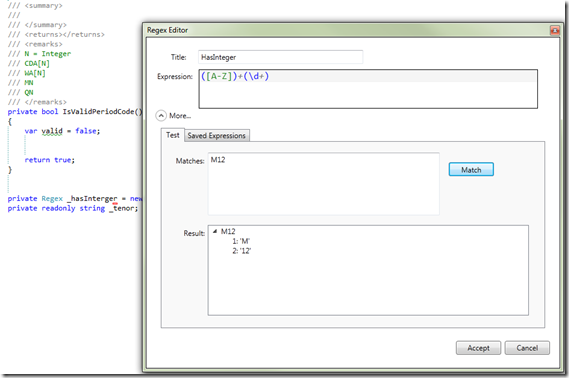 Tagged: Visual Studio Regular expressions. 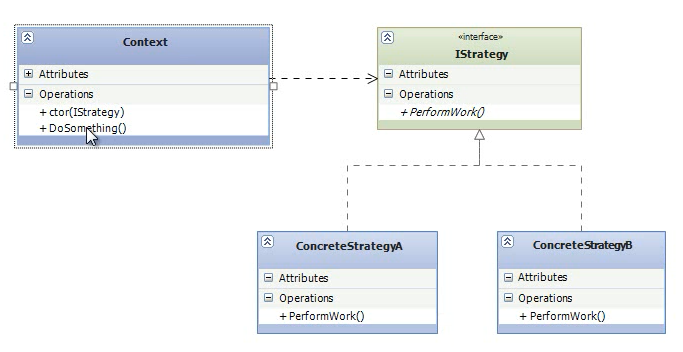 The Event Programming Model (EPM from her on in) was introduced in .NET 2.0, it’s purpose was to serve as a simpler pattern for asynchronous operations than the Asynchronous Programming Model (APM / IAsyncResult, see my previous post on APM) where possible, mostly in UX code. Methods that use this pattern typically end in Async and have a Completion event. The best known implementation of the EPM is the BackgroundWorker component, it’s got a distinct advantage in that it tries to use a synchronization context to fire the event on the thread from which it was called, the APM on the other hand offers no such guarantee. 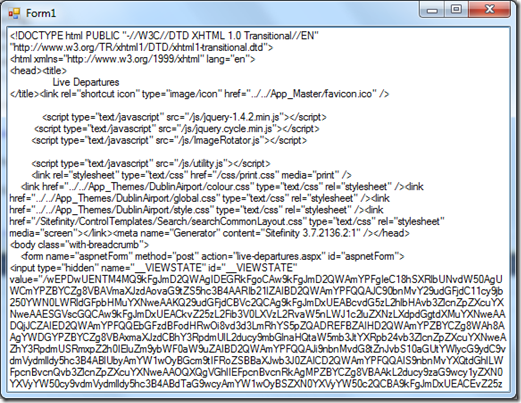 What you can see in the snippet above is a simple windows form (been a while my old friend) application. Let me paint you a picture, it’s early February 2012 and I’m stuck here at Brussels international airport, in the middle of a snow blizzard wondering if I’m going to have a flight home. The plane that will take me there is arriving in from Dublin so I’m looking at the live departures to see if it’s departed (already 15 mins late darn it.. ) anyway back to the post at hand; I’m downloading the page html with the call to DownloadStringAsync(), you can see in the completion event handler that I’m not doing any Invoking (dispatching to those of you that never had the pleasure of windows forms). Now this is what it looks like after the event gets fired. 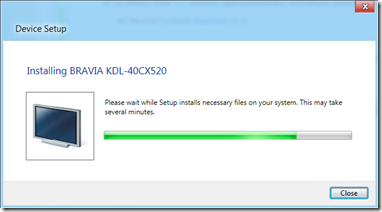 hey and looks like it’s running MS tech (notice that viewstate, incase the .aspx didn’t give it away!) nice! If you come from a web background this may not seem that odd to you, but if you started out desktop application development like me there was one golden rule you never forgot and that’s that always talk to the GUI in one thread and one thread only. Sadly TPL doesn’t handle the EPM as easily as the APM specifically in respect to the synchronization context, but lets see how we approach it, you may have to if you’re pre .net 4.0 as the DownloadStringAsync doesn’t exist! With the code above we hit the cross-thread exception problem. We could do a Control.BeginInvoke (or Dispatcher.BeginInvoke in WPF), but lets imagine we were writing a library and we wanted it to be framework agnostic, how would we do this? Encapsulate a family of related algorithms such that they are callable through a common interface. Independent evolution, algorithms can vary and evolve separately from classes using them. How do we know when we should consider the strategy pattern? Adding a new calculation to a class could break existing calculations (breaking the Open-Close principle, i.e. a class should be open for extension, but closed for modification. 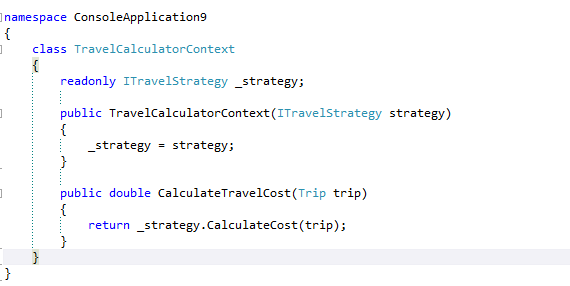 Here we see the strategy is getting passed to the context in the constructor, this class should be closed to modification, Trip is just an empty class for my demo and it’s not actually used in the calculation sample. So, what is the strategy pattern again? It’s something you possibly do on a day to day basis and you don’t even realise it. e.g. 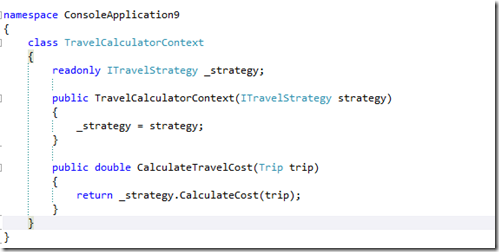 If you write ASP.MVC code, you quite likely are passing interfaces to you controllers for dependency injection and testability ---> Strategy pattern.